As I’m sure you all know by now, I can’t get enough of nail art. I’m always looking for new ideas, techniques, and styles. Admittedly, when there isn’t a holiday or big event going on, sometimes it can be hard to think of new, creative nail art ideas. Enter Nail Art Society. I recently signed up for Nail Art Society, a monthly kit of curated nail art tools. After receiving my first kit, I’m in love. 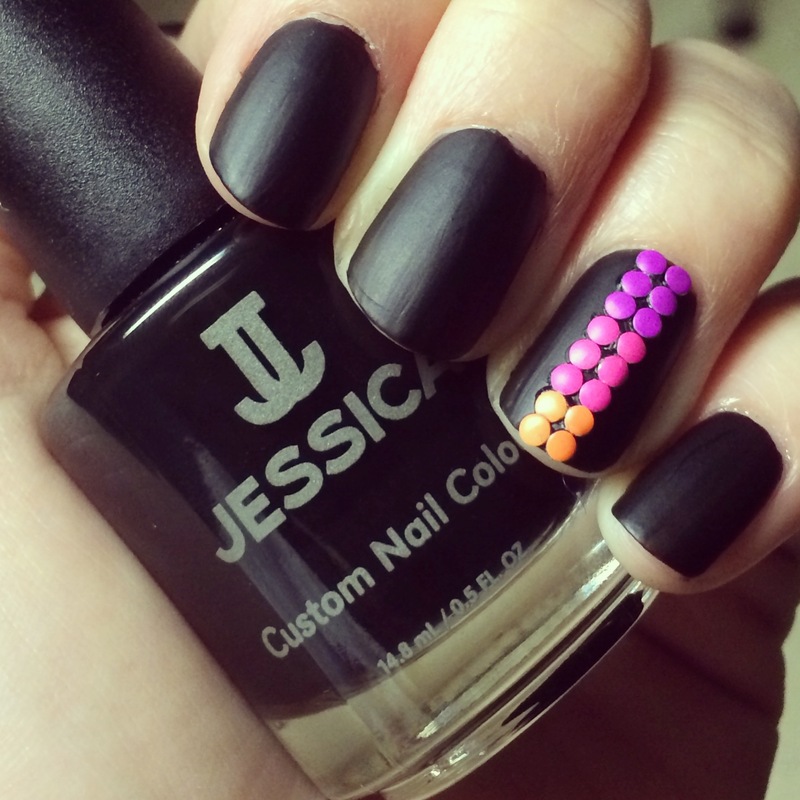 Read on to see how I completely this look – entirely from this month’s Nail Art Society kit! I started my manicure with my usual filing, buffing, and a coat of Nail Tek II. I then applied two coats of Jessica Custom Nail Colour in Black Matte, which is an amazing deep black matte polish. I had never tried Jessica Custom Nail Colour before, and I have to say that I was pleasantly surprised! The polish was opaque and my manicure lasted just as long – if not longer – than most other manicures. I let my manicure dry completely so that I could work with the nail art studs. Taking one stud at a time, I applied a dot of matte polish where I wanted the stud to go and carefully placed each stud one at a time using tweezers. I finished the manicure – and sealed the studs in – with NYC’s Matte Me Crazy Mattifying Top Coat. I absolutely loved the matte look with the shiny studs, so I had to keep the matte look going! Was it time consuming? Yes. Was it worth it? Definitely. This is one of my favorite manicures to date (do I say that a lot? ), and I can’t wait to try nail art studs again soon. Have you tried nail art studs? Share your photos with us on Twitter @Collaboreight! Love this look; shared your picture with co-workers who all flipped over it! Keep ’em coming.